Timebus celebrated twenty years in business with a running day based in the Harrow area on Sunday 7th October 2007. Timebus Travel was established in October 1987, and grew from operating just our Regent Low Height to a fleet of twelve historic London buses. These are used on private hire work, mostly in London. A variety of these fully PSV licensed vehicles were available to sample at our anniversary event, staffed by our professional crews, who also issued paper Gibson tickets. 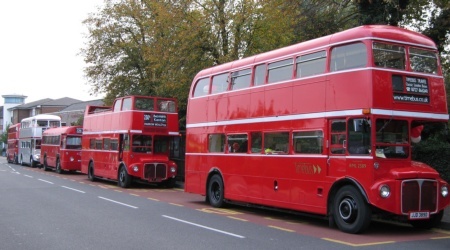 Vehicles used included Timebus' red Regent Low Height (RLH 23), Silver Routemaster (SRM 7), single deck Regal Four (RF 491), Open Topper with Open Platform (RM 450) and closed top red Routemasters (types seen from left to right in the photograph, right). 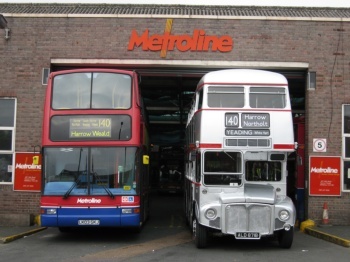 Our thanks to: Metroline for kindly allowing use of Harrow Weald garage as a vehicle base, Transport for London for their assistance, and finally our drivers, conductors and controller for their hard work during the event and over the years. 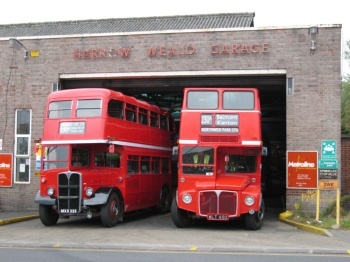 Route 136 was operated by RFs from Harrow Weald garage from 8/66 to 7/71. More historical information. 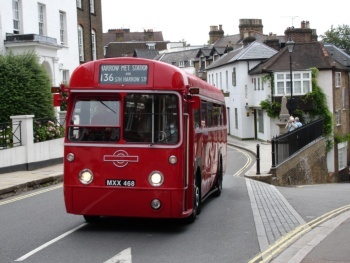 Route 140 was operated by Routemasters from Harrow Weald garage from 7/78 to 4/83. Historical information. SRM 7 is pictured alongside a modern equivalent, left, about to commence running on route 140. 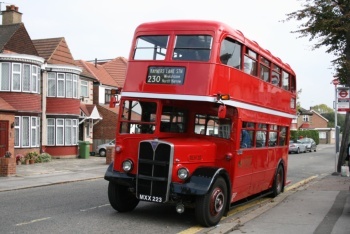 Lowbridge route 230 was operated by RLHs from Harrow Weald garage from 12/52 to 6/69. Historical information. RLH 23 seen, right, at the Northwick Park terminus during the event. Photograph by P. Edgar. Both vehicles are pictured, left, about to start the morning run. This page may be updated again with minor improvements. Last update: 2007-10-25 (post event).